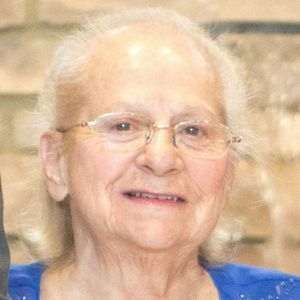 Frances Theresa Weimer (nee Calderone), 87 of Avon Lake passed away Wednesday, March 6, 2019. She was born October 10, 1931 to parents Santo and Annette (nee Calarco) Calderone. Frances was known as Nanny to her family and she was our loving angel on earth. She was a true servant to God and loved unconditionally and displayed kindness to all people she met. Frances was a graduate of Johnstown High School. She worked in the banking field in various banking positions for over 50 years. She was a member of Holy Spirit Church. She attended daily mass and was a member of the prayer group, choir, Holy Spirit Ladies Guild and Young in Spirit. She also worked as a part time receptionist at Holy Spirit, and volunteered on Sundays to count the collections. She loved serving and volunteering at church often known to help, whenever she could. She is survived by her beloved daughter Judy Smith (Thomas G.) of Avon Lake; loving grandchildren Thomas C., Timothy M. (Morgan) and Tyler R.; dear great-granddaughter Cecilia; sisters Mickie Skrabut and Rosie Gyurkovics and several nieces and nephews. She is preceded in death by her beloved husband of 32 years Richard D. Weimer; parents Santo and Annette (nee Calarco) Calderone; and her brother Nunzio Calderone. In lieu of flowers, memorial contributions may be forwarded to Holy Spirit Church 410 Lear Road, Avon Lake, OH 44012. Add your thoughts, prayers or a condolence to Frances 's guestbook.